I have previously been disappointed with baking fish, it was never as good as when my husband BBQ's it. But my husband was coming home late, so I had to cook this fish by myself. So off I went looking for a recipe, as I didn't really know what to do with the whole fish. I do know how to cook fish, but with baking tonight I really felt like something nice, something fantastic. A lot of recipes you find when you Google 'whole baked fish' are Asian based, and tonight I just didn't feel like those flavours. Then I came across this Donna Hay recipe, I had the fish and the rest of the ingredients were so simple, they were all things I have in my house all of the time. I went out and bought a bottle of Tempus Two (as it is my favourite sparkling wine-thank you Nik and Anna-I drank this at your wedding and have loved it ever since), as I really did want to make tonight a special dinner. Even though this was a midweek meal I felt like making my meal spectacular. So I poured myself a glass of wine, something I love to do while cooking is sipping on a wine. Then I went about preparing the fish. Preparing the fish was easy (it was scaled for me and cleaned already). I weighed the fish, so I could figure out how long to cook it. Then I did some simple prep work, and I mean really simple. And then I put the fish to bake. The aromas that wafted around my house were amazing, the promise in this dish was looking good, and I had only smelt it so far. I was so hoping that the fish tasted as good as it smelt. With every minute of cooking the smell was teasing me, honestly, this is not me being over the top, it really does smell that good. I baked my fish to perfection. I really did. When I served it on the table, I was excited. Now I wish I had plated up a little better, something I don't generally focus on, as it would have been great to make this dish look as good as it tastes. So I put some fish on my plate, sprinkled it with the lemon salt, added a dollop of aioli and served it with some broccoli and a lemon wedge. The flavours were so amazing, the fish was so nice, so fresh, the flavours together 'worked' as the MKR judges like to say. This is one dinner that was 'memorable'. It is a dish where every mouthful was just amazing. I hope someone gives this a go, as it truly was easy and it was a special midweek dinner for us. 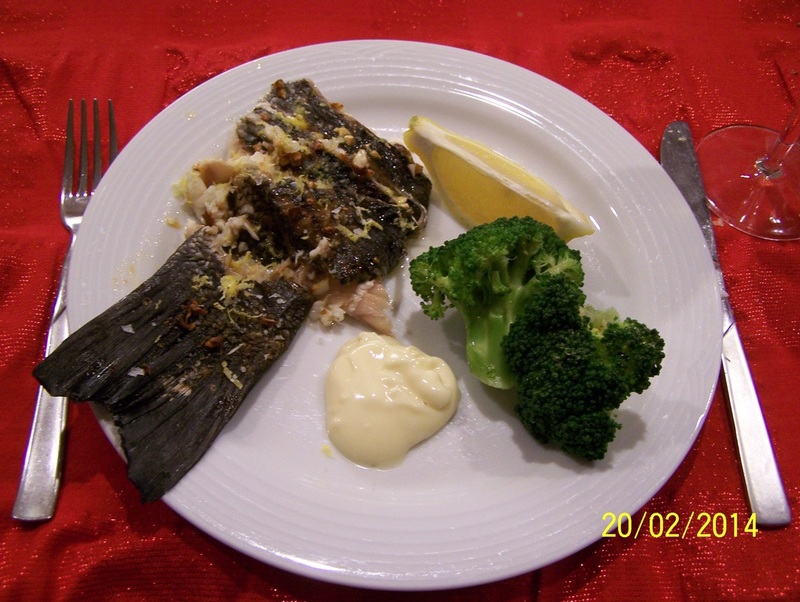 Now Donna Hay's recipe was for a 1 x 750g fish, and she baked it for 30-35 minutes, my fish was twice that size. As I have only made it with the larger fish, I will write the recipe as I made it, but will show Donna Hay's cooking times also, if your fish is smaller use Donna Hay's cooking time as your guide. Also the fish we used was a Black Drummer fish which my husbands friend caught for us. In Donna Hay's recipe she suggests using snapper or bream. Take the fish out of the refrigerator 30 minutes before you need to cook it, so it is not really cold going into the oven. Make the lemon salt: place the lemon rind in a bowl with the salt flakes, mix to combine. Set aside. Make the aioli: In a small bowl mix together the mayonnaise and garlic, refrigerate until needed. Using a sharp knife, make small slits in the fish skin, on both sides. Lightly season the fish with salt and white pepper. Combine the butter and garlic. Place 1/2 tablespoon of the butter mixture in the cavity of the fish. Spread the remaining butter over both sides of the fish. 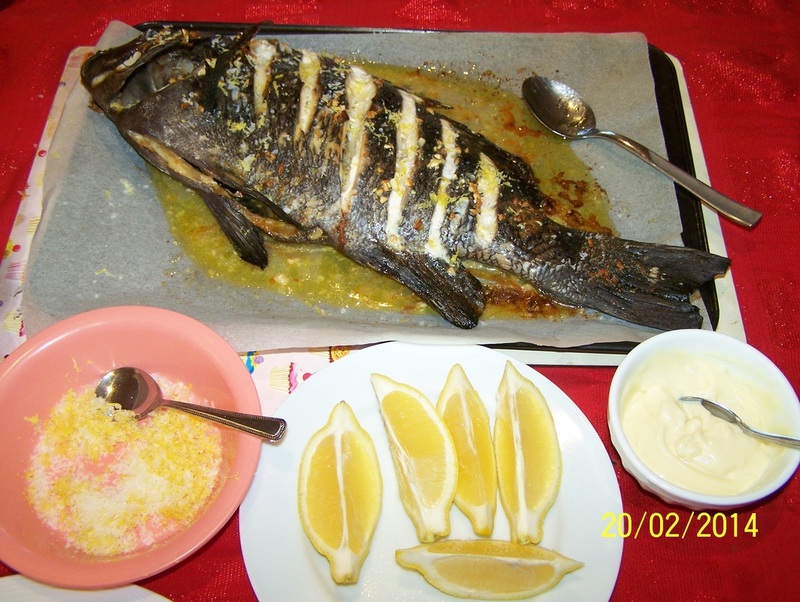 Line a baking tray with baking paper and place the garlic buttered fish on top. Bake smaller fish for 30-35 minutes, I baked my larger fish for 40-45 minutes (42 minutes to be exact) or until cooked through, test with a fork, the fish is ready when it flakes away from the bones. Serve with lemon salt, aioli and lemon wedges.